While Yark Collision Center can’t prevent the accident, we can make it easier. 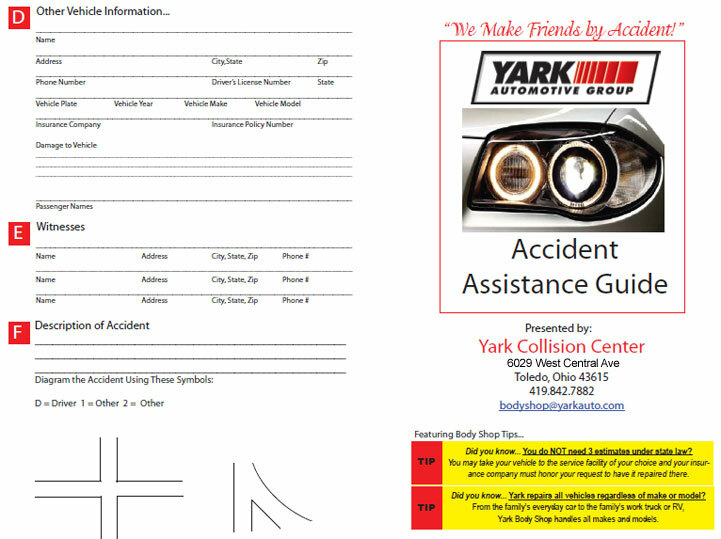 Yark Collision Center’s staff is happy to offer you an accident assistance guide. We hope that it will be useful information for you if you get into an accident. If you have questions we are here to help. Simply give us a call or fill out our convenient online form with your questions. On a budget? View our specials and coupons to save as much money as you can when you get car repairs in Toledo, OH. Restore your car to “like-new” condition when you visit the Yark Collision Center in Ohio! Simply click the image below to get a printable guide.